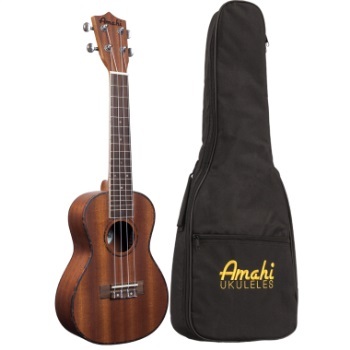 The Amahi UK220C mahogany concert ukulele is an affordable intermediate model instrument that is great for beginners as well as more advanced players. There are bolts in the bridge hidden under an inlay to help prevent the bridge from coming loose, which is the most common issue with inexpensive ukuleles. It also has real frets that are level, which is not usually the case with ukuleles in this price range. The edge does have binding, which helps protect the top and back from damage. A carrying bag is included.